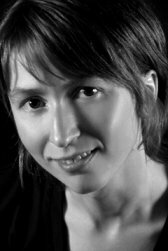 Nicole holds a Bachelor of Music University of Alberta and a Master of Music University of Victoria in percussion performance. She has performed with the Edmonton Symphony Orchestra, the National Youth Orchestra of Canada, the Victoria Symphony, the Kamloops Symphony, and presently plays timpani and percussion with the Okanagan Symphony and the Vancouver Island Symphony Orchestras. She first heard the marimba at the age of 16 and has been captivated by it ever since, performing solo concerts, chamber music with the Tan Trio Trish Clair Peck, violin and Chris Helman, saxophone, and mallet concertos. Nicole enjoys teaching piano and percussion is currently a Kindermusik educator and Suzuki piano instructor at the Nanaimo Conservatory of Music.